Roadie 2 Review - Does the Automatic Guitar Tuner Stack Up? The Roadie 2 guitar tuner is now available with several substantial upgrades over the original Roadie. But do they make that much of a difference? And can an automatic tuner really be trusted to be fast and accurate? Get the inside scoop here, including a video review so you can witness our hands on experience yourself. Whether you're a professional guitar player, a beginner still in the learning stages, or even a guitar technician looking for a faster and accurate way to get through those million restrings you have to do, the Roadie 2 has something to offer you. There's a lot to be said for automatic guitar tuning. Not all of us have perfect pitch, and being relatively in tune with your own instrument is fine unless you're in a band. But the real question for anyone looking into a tuner like this is whether or not it's accurate, for one, but most importantly they want to know if it's dependable. Well, we put this device through the ringer to get the real scoop right in our own hands. And we're here to tell (and show) you the results. Today we'll walk you through everything you need to know about this piece of hardware, its software, and how to put it to the most effective use so you can get the most out of it when it matters most. By the time we're done, you'll know, without a doubt, whether or not this ground-breaking tuner is right for you over other types. First, let's look at what changed from the original Roadie 1 when Band Industries released their new and improved version 2. What's New in the Roadie 2? If you set the old Roadie and the new model side by side, physically you'll notice a few key differences. There's some superficial changes regarding the shape and color of the chassis that holds the battery and motor. The new one comes in at just 0.2 ounces heavier with slightly different dimensions. They aren't significantly different in size at all. The two changes that should pop out at you immediately is the scroll wheel on the back with the LED indicator shining through it and the addition of the rounded LED screen on the top. This represents the core and most substantial upgrades you'll notice. The scroll wheel is what allows you to navigate through the software options that are displayed on the screen, which you can click by pressing the scroll wheel inward like a mouse button. Previously you had to use a mobile application for you smart phone to control the Roadie 1. The problem with this meant you had to own a smart phone and keep it charged while remembering to keep the battery on the Roadie charged. Now, it's all built into the device itself, although you can still use a smart phone app if you choose. Perhaps the biggest change of all is the addition of vibration sensing, meaning the Roadie 2 will detect the vibrations passing from the string through the headstock and tuning pegs in order to tune your string up to the correct pitch. This is a big upgrade over the previous model which depended upon listening to the strings with a microphone, which can be problematic in a noisy environment. Don't worry if you don't have time to sit through the video. We'll cover everything from the video and more below. When you fire up the Roadie 2 by pressing and holding the scroll wheel button for a half of a second or so (this is also how you turn it off), you'll immediately be greeted by their logo on the screen on top for only a moment before being placed right into your customized options. That's right, you can customize the features for your specific set up. Although the Roadie 2 can tune a banjo, mandolin, guitar, ukulele, and various versions of each, what's the point of having to deal with all of that if you're only using it for one specific instrument? There isn't one, which is why their customization choices really enhanced our user experience. Let's start from the biggest picture options and work our way down. First of all, imagine you and your bandmates all purchased their own Roadie 2 tuners. How do you know who's is who's when they're all tossed in the same gig bag or get switched around during the shuffle? Within the software, you can name your Roadie so you can distinguish yours from everyone elses. You can change the default name to your own name or a nickname for the device so you can immediately identify whether or not you're holding the correct one. That's important due to the next set of customizations. The next step downward is where you can set up an instrument list for yourself. Perhaps you only play the banjo, mandolin, and guitar. You can choose those from the set of universal instruments the tuner can handle and keep them in your own personalized shortlist, so you never have to encounter the ukulele options. The last customization you'll make is which tunings to use for your instruments. For instance, when you click into your instrument list and click "Acoustic Guitar," you'll see the list of strings. If you click again you can change the tuning to choose any number of alternate tunings. For the mandolin, as another example, you'll see Standard and Get Up John as your two options. Beyond the string winder and unwinder to help you quickly change strings, there's a few other settings you'll want to explore, just to know they're there. When you click into the main Settings section, the first choice is where you'll rename your tuner. The second is a diagnostics test that runs through every LED light and software configuration to make sure there's no errors. It may be able to fix itself if there are, but we didn't encounter any problems during our usage. The next setting is for the Front LED, which you can turn on to use as a flashlight or to help you see your tuning pegs as you tune in low light environments like on stage. And finally you have the Tune Up option, which tells the Roadie if you want to tune up to a pitch or down to a pitch. It's set to tune up at default, which makes the most sense for the majority of cases. Dimensions 3.4 x 3.0 x 1.0 in. As you can see, they tell you everything you might possibly want to know if you're a tech-head like me. It's all a part of my decision making progress, and full transparency is always nice. At the end of it all, I can heartily suggest this tuner, as have many others, including professional guitarists from some of the most successful bands of all time. But, one thing they all don't tell you are some of the nuances, which I'm perfectly happy to reveal. One of the issues you may want to consider is if you have the average sized tuning knobs on your instrument. Not all tuning machines are built the same, especially on older instruments. But the Roadie 2 does try to accommodate a variety of sizes. We had an older acoustic that had gigantic tuning pegs which couldn't fit all the way into the recessed area of the tuner's motorized "grabber." Did it still tune for us? You bet, we just had to turn it sideways a bit to grab onto the pegs, which you can see in the video above. Another issue we encountered was that it, albeit very rarely, had trouble latching onto the vibrations of a specific string. We had to tune it a bit closer by ear and pick a little harder before it picked up the vibrations. But it did ultimately tune the string for us. You have to be close enough within their detection range, which could have been our issue. You'll learn these nuances yourself and likely realize it was a user error on our end. The only other possible issue you could encounter is the software freezing up, which happened to us one time. We stuck a paperclip in the "reset button hole" and it restarted in a matter of seconds. I wouldn't even call this a problem, honestly. It was a pleasure for it to restart so fast while still saving our instrument list and alternate tunings. Those are the honest negatives that you likely won't encounter with more modern and standardized instruments. The positives were too much many to even mention, and they're all explained simply by talking about the features. This thing gets my enthusiastic praises. My brother is a professional guitarist and guitar technician. He was skeptical when I told him I got this tuner for myself, a beginner, but as we tested it (as seen in the video) he started asking me if he could have it because it would really speed up his tech process of set-ups and restrings. I almost caved in but realized he can buy the tools he needs for himself. He can't have my Roadie! We both give this automatic tuner our stamp of approval. When we set out to do a Roadie 2 review, we had no clue what the outcome would be. It was overwhelmingly positive as you've read, which is good because having to say something bad is never fun. Thankfully Band Instruments have pumped out an amazing product here that you can buy with confidence. We previously had compiled a list of the best guitar tuners, before we encountered the Roadie line-up. So the question we had to ask ourselves is does it stack up to the rest of the best? Does what it has to offer beat out other types of guitar tuners like pedal tuners, metronome style tuners, and clip-on tuners? They all have strengths and weaknesses. For instance, pedal tuners now have state-of-the-art polyphonic tuning which can help you tune all the strings at once. But you still have to do it yourself and it only works for an electronic instrument. Clip-on tuners use the same vibration sensing technology as the Roadie 2, but you can only tune one string at a time and have to do it yourself. The metronome boxes are pretty accurate and time-tested, but it's still a string at at time and you have to use its microphone, which is a no-go for live gigs or jams. The automatic guitar tuner we're talking about here (the only one of its kind as far as I know) still encounters some of these issues. You still have to tune one string at a time, but it's faster. 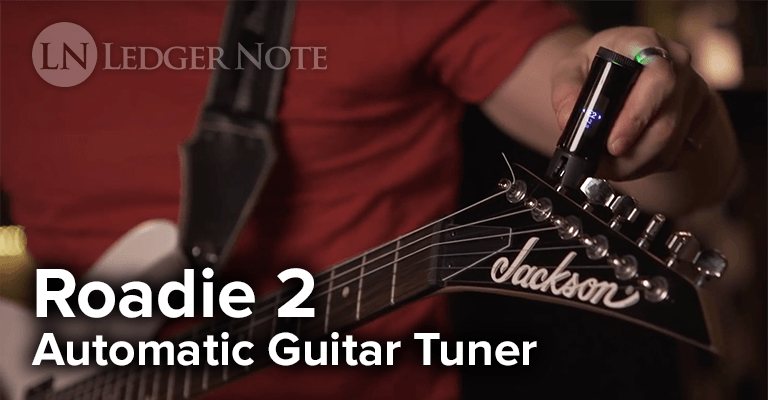 The Roadie 2 indicates to you once it's done tuning the first string and will set itself up to switch to the next. You can blow through all 6 strings in a jiffy. Another strength is that you don't have to have perfect pitch or be in a quiet listening environment. It will do the tuning for you automatically based on the vibrations of the string. And finally, once you've keyed in your software preferences, you'll be set up for your alternate tuning and set of instruments without having to set it up on other tuners and recalling the settings (if they even have them). If you juggle the pros and cons of the different types of tuners and are looking for something that solves most of the problems of the others, or at least improves on the challenges it can't fully solve, this tuner really holds its own out there in the playing field. I think the real strength that it provides over others is the instrument list with saved alternate tunings as well as the automatic tuning. You could whip this out between songs on stage and be back in perfect shape in a matter of 10 seconds or less, all without fiddling with tuning knobs and trying to tune visually. It really depends on your style and tolerance for annoyance. This removes any annoyances. You no longer have to settle for "close enough" and having a hard time reading cruddy screens and LED's on other types of tuners. My opinion is you will be more than satisfied if you give the Roadie 2 a fair shake.